Hello everyone, I am Mahesh, the son of Sri M.K. Ramasubramanian (Ramesh, MKR or KMR to most of you on rasikas.org). As the rasikas.org community has become an important part of my father's life, I thought I would take the liberty of sharing an important milestone with all of you. 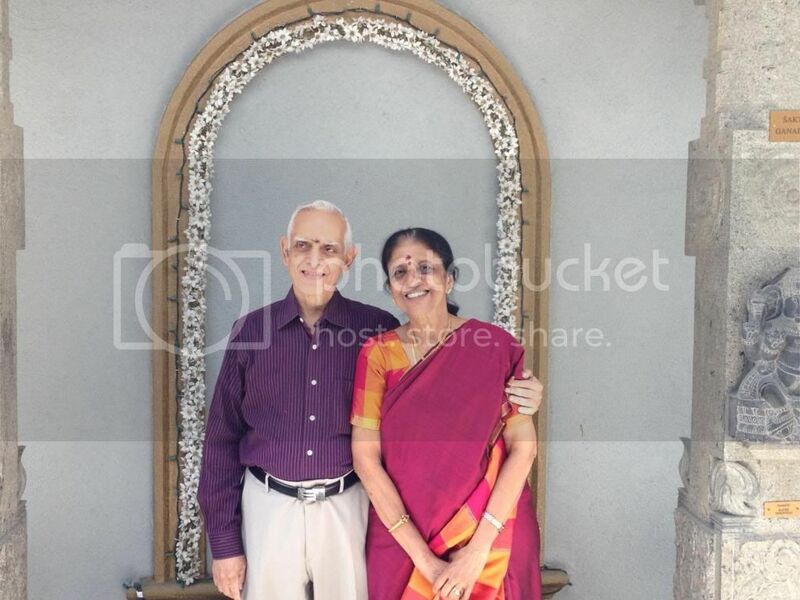 Today, May 3rd, marks the 50th wedding anniversary of my parents - Ramesh and Nirmala were married on this day in 1964 in my mother's hometown of Coimbatore. We marked this special occasion here in New York today with a small archana at the Queens temple and followed up with a dinner for close friends and relatives in the area. I am sure that many of you will join me and my younger sister in wishing my parents many more decades of happy married life together. One of the most 'binding' effects in my parents' marriage has been the love of music which has been a constant nearly every day of their married life together. Hope you all enjoy these wonderful pieces of nostalgia as much as I did in 're-discovering' them! If I find any other great old photos, I will post. Cienu Anna, please share these photos and the milestone with your mother. She was (and is) so much a part of that happy day and many others after this in my parents' lives. Last edited by maheshram on 07 May 2014, 07:49, edited 1 time in total. Last edited by venkatakailasam on 04 May 2014, 12:42, edited 1 time in total. MORE POWER TO YOUR PEN! More smiles to your life! More music to your soul! And Mahesh, welcome to the forum! The photos in chrome browser generally appears truncated right click on the photo and open in new tab to see the entire photo. Mahesh -- welcome to the forum. Your appa's 80th birthday is just few years away. Shri MKR ,wishing you and your wife Mrs Nirmala, a very happy golden wedding anniversary. A big thanks to your son Shri Mahesh for sharing the precious photos from your wedding. 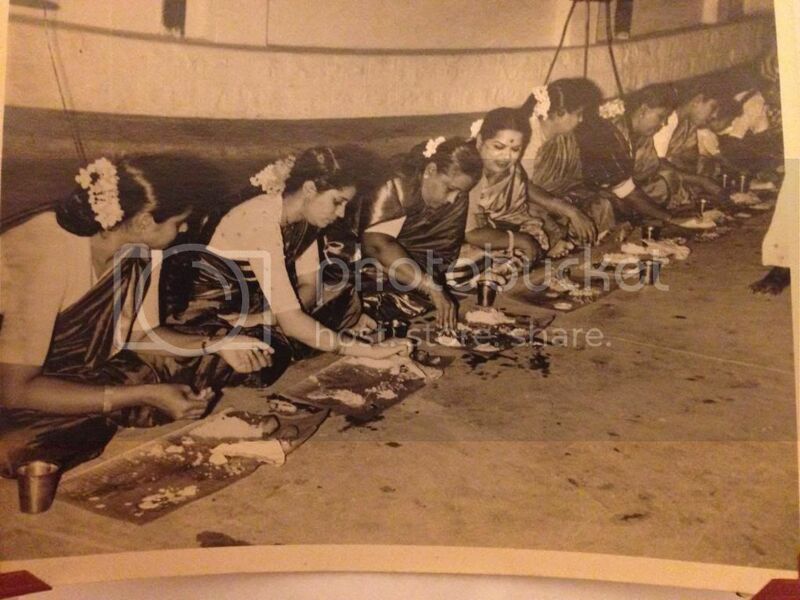 I really love the photo where MLV Amma and others are enjoying the kalyANa sAppADu. And the oonjal photo is very nice. Ramesh Mama - best wishes for many, many more years of bliss! Please continue to entrall us with your memories. Mahesh - Thank you for the wonderful pictures and the write-up. Narration must run in the family! And maybe you can persuade your father to turn his memories into memoirs - something we've been asking him to to for some time now. maheshram, welcome and thank you so much for this. Mr and Mrs MKR... congratulations and very best wishes for many more years, many more anniversaries and much more music. Meeting up and talking with Sri MKR is a high point of Chennai December for me. His own musical 'performance' has added magic to at least two of our Rasikas.org international meetups. Many more happy, healthy years of togetherness! Thank you for sharing these special pictures with their Rasikas.org pals Hope more are coming. May 50 turn into 75 with the same smile and charisma. Our Namaskarams to you. Hi Everyone, thanks for the wonderful comments. I only made my parents aware of my post this morning, they were pleasantly surprised by all your comments! 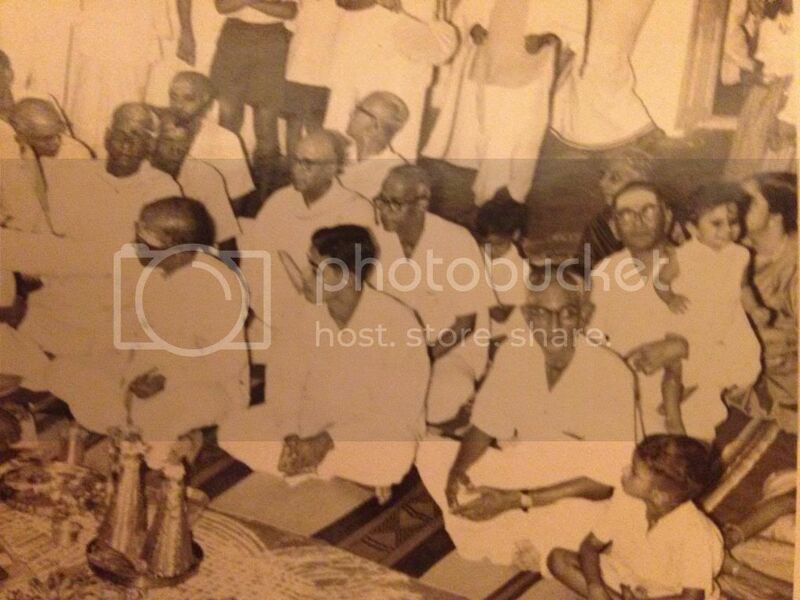 But still no one has identified the smiling child in front of Sadasivam Mama...where are the detectives in our midst? No, she was born after me so that would be a chronological impossibility...keep guessing! Good guess, but incorrect...time for a hint: remember our custom of dressing young children sometimes in a "gender confusing" way..
Congratulations Sri.MKR and Smt. Nirmala. Mahesh, you did a great job in putting this together. Thanks. Great pictures indeed. At the outset congratulations to Ramesh Mama and Nirmala Mami on the occasion of the 50th wedding anniversary. And thank you Mahesh for uploading the pictures bringing back past memories. I showed them to Amma and she was extremely happy to see them. ! She conveys her congratulations to the young couple ! Amma also remembers learning Upamugana from Brindamma and she immediately sang the same when I mentioned that she had sung the same at the Oonjal ceremony.! Amazing memory. Last edited by cienu on 05 May 2014, 08:51, edited 1 time in total. Dear Chinu Anna, my parents are overjoyed to see your post. Your mother is and always has been a most special part of our family's lives...please also convey my namaskarams to her (she will know me as Ramji as you know). Has Aishwarya learnt Upamugana yet? If not, consider this as a special 'listener's request' ahead of her U.S. tour in the near future?! Shri Mahesh, welcome to the forum! Shri MKR Avl,wishing you and your wife Mrs Nirmala, a very happy golden wedding anniversary. Pray Ayyappan to shower all HIs best to you and to all the members of your family. Folks: Myself and my wife are simply overwhelmed by your messages of affection and goodwill.As my son rightly put it our interest in music has sustained our companionship all these years. Personally since I joined the forum,I have enjoyed the contributions--selfless and informative--by all of you. Our lives have been enriched by our association with Music and Musicians from whom we have gained so much insights into art and its pursuit. The next day after our anniversary, we attended a Violin Duet concert by the Lalgudi Siblings and GJR announced during the course of the concert to the crowd about our wedding anniversary and mentioned the long association with our two families--needless to say we were humbled by the gesture. I must thank my parents--the late K.S.Mahadevan and my mother( Narayani alias Chinnani- 94 years old) for their encouragement of my interest in Music. My mother even today can recite all 32 Thyagaraja krithis in Thodi although she may not remember all our names--a gift from GOD!! 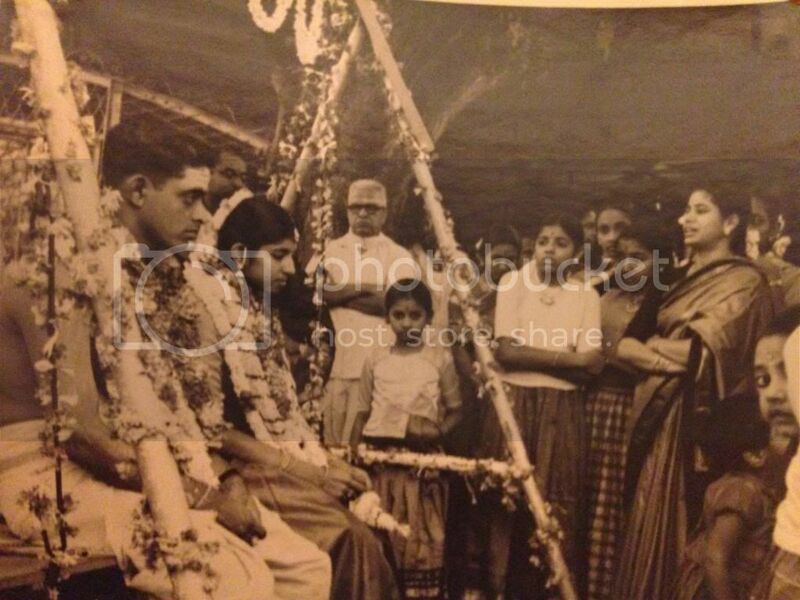 One of the pics my son posted showing MLV and Mrs Vasan and T.Rukmini--all of them were close to my mother although in terms of social class and stature we were nowhere near them--took the trouble to attend the wedding despite their engagements. My mother had the charisma to attract people(MLV loved my Mom's Vathal Kuzhambu and Badam Kheer--she had the sweetest tooth of all with the possible exception of Violinist Rajamanikkam Pilai who never travelled outside of Chennai without atleast one bottle of Horlicks with Therattippal and he was a Diabetic too!!! The Music celebrity world that I grew up in and the relationships that my parents developed over the years with the erstwhile musicians have sustained our younger generation as well. When I was growing up,I never had time for participating in Sports because as soon as I come home chores will be waiting for me to "enagage" the visiting artiste(we hosted) with shopping,fetching groceries etc--I used to curse my fate--now I do not regret a wee bit because I would never have been a good sportsman but I certainly can lay claim to be a good listener and 'observer" of the cultural scene. Once again thanks to fellow forumites for your good wishes and greetings!!! 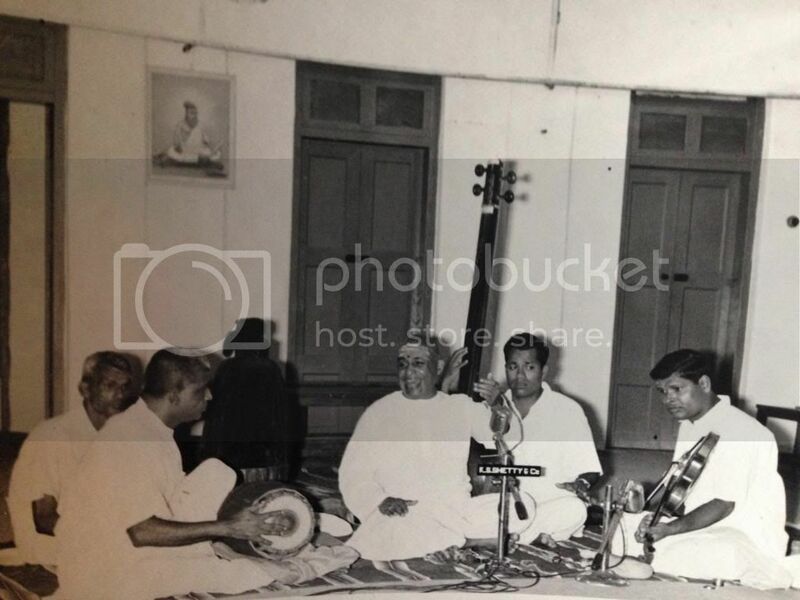 Re The KalyanaKutcheri please note that the violin vidwan was Kovai B.Dakshinamurthy s/o Balaganesa Iyer, flute vidwan. He was an AIR artist and a Telugu Brahmin and not a Pillai. Hearty congratulations on the wonderful occasion. Wishing you a lot of good health, music, happiness and 50+ more years together! Seeking your blessings too. What a lovely tribute with wonderful! I am a nephew and disciple of Sri Kovai Dakshinamurthy. He is my father's first cousin. His father TK Balaganesa Iyer was my Chinna-thata. I met your parents in 2010 at NY Shrutilayaa and they had mentioned about this wedding concert back then. I recall MKR Mama mentioning that this was perhaps the first time Sri BDM had played for Sri SSI and it happened due to the request of your family to have Sri SSI encourage the (then) young upcoming family friend of theirs. How fortunate I am to see the photo today! I will forward this post to my Guru's family. PS: You are not the first one to add Pillai to BDM's name. Helps that it matches the name of the kanjira legend! On a lighter once I was announced as disciple of Kovai Dakshinamurthy Pillai, an the main artiste quipped "Avar Dakshinamurthy, ivan thaan avar-oda pillai".